A short post to finish the year in style. And what better way to round off a year* than with two records by Franco and the O.K. Jazz. I assure you music does not get a lot better than this. These four tracks, composed by Franco himself and recorded on February 18, 1960 for Editions Loningisa, are among my absolute favourites, - and not just of the early work by Franco. The songs stand out for several reasons. First the line-up is unique, with the departure of Vicky Longomba (first to join Kabasélé at the Table Ronde and then to start his own orchestra: Négro Succès). To replace him Mulamba Joseph a.k.a. Mujos had joined the O.K. Jazz and he is the Vicky-like voice in these songs. 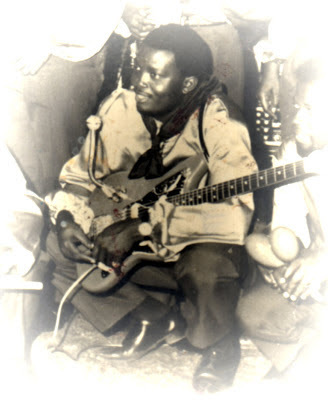 Isaac Musekiwa too had defected in July the year before, after Franco had been imprisoned for a traffic offence; he had joined Orchestre Vedette Jazz but returned to the O.K. Jazz at the end of 1961. He proved difficult to replace, and I am not sure who is playing the sax in these songs. The O.K. Jazz did engage others such as trumpet player Dominique Kuntima, better known as Willy (who is perhaps best known for his time with African Jazz and African Fiesta), and clarinetist Edo Lutula a.k.a. Edo Clari, and in 1961 Albino Kalombo (who had gathered fame alongside the great Léon Bukasa at Ngoma). On guitar Franco was joined by Bombolo Léon a.k.a. Bholen, who had been recruited by Vicky, as had been singer Hubert 'Djeskin' Dihunga. Both were later persuaded by Vicky to join him at Négro Succès. But the most impressive new recruits to the O.K. Jazz were two singers. First a singer of considerable repute: Gérard Madiata (whom you may remember from his songs with Kongo Jazz). He is the star of that immortal cha cha cha "Cuando Paradi", - and this while only singing backing vocal! The second is Jean Munsi, better known as Kwamy or - in those days - Coimy. As Gérard Madiata in "Cuando Paradi" he adds that very special something to the equally immortal boléro "Caro Simon Mabanzo", even though he is not the lead singer. His velvet voice is the secret ingredient to one of Franco's most exciting boleros. But star of these four tracks is of course Franco himself. In "Mobembo Ya Franco Na Wele" he is tiptoeing, in "Cuando Paradi" he is cheekily doing pirouettes. In "Mobali Asundoli Ngai Na Mwana" he is in charge and leading the orchestra, dictating breaks and turns. But "Caro Simon Mabanzo" sees the master in his natural environment: the boléro. He adds an extra dimension to the song, adding tension, joking, coaxing, provoking, in short: being Franco. I wish you all a very happy and successful 2013! * or for those in more eastern time zones: to start the new year! This post is about an artist who has - in retrospect - been relegated to the ranks of dated 'popular music' and 'entertainment'. But Louis Vera Da Fonseca, or just Fonseca, was up there with the Big Names, in his days. 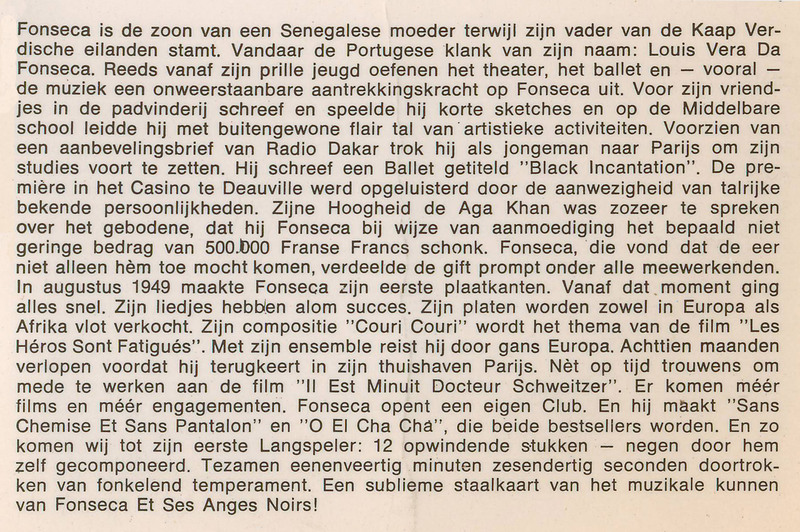 The sleeve notes on this Dutch lp are almost ecstatic: "Fonseca is the son of a Senegalese mother while his father is from Cape Verde. Hence the Portugese sounding name: Louis Vera Da Fonseca. From his early youth the theatre, ballet and - especially - music have held an irresistable attraction for Fonseca. For his friends in the boy scouts he wrote and performed little sketches and in secondary school he with exceptional energy devoted himself to a variety of artistic activities. Armed with a letter of recommendation from Radio Dakar he travelled to Paris to continue his studies. He wrote a ballet titled "Black incantation". The opening night in the Casino in Deauville was attended by a score of celebrities. 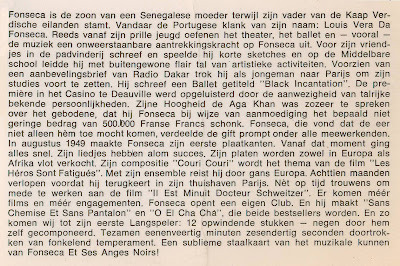 His Highness the Aga Khan was thrilled by the spectacle to such a degree that he, as an encouragement, presented Fonseca with the considerable sum of 500.000 french francs. Fonseca felt the credit shouldn't go to him alone and promptly shared the gift with all his colleagues. In August 1949 Fonseca made his first records. From this moment on matters accelerated. His songs are widely successful. His records fly over the counter in both Europe and Africa. His composition "Couri Couri" is chosen as the theme of the film "Les Héros Sont Fatigués". He tours the whole of Europe with his ensemble. Eighteen months go by before he returns to his home base in Paris. As it happens, just in time to cooperate in the film "Il Est Minuit Docteur Schweitzer". More and more films and contracts follow. Fonseca opens his own Club. And he makes "Sans Chemise Et Sans Pantalon" and "O El Cha Cha", which prove bestsellers. And so we arrive to his first Long Play record: 12 exciting tracks - nine composed by himself. A total of forty-one minutes and thirty-six seconds permeated with a sparkling temperament. 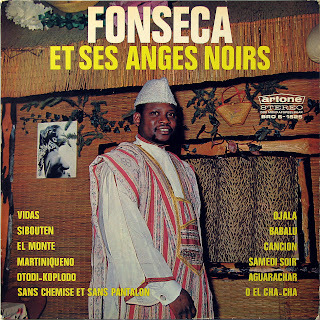 A excellent sample of the musical capabilities of Fonseca Et Ses Anges Noirs!" This may all sound very boy scouty to the modern cynical blog reader. But the paradigm of the perception may shift when one considers that the artists originally scheduled to perform at the Table Ronde in Brussels (the round table conference about the independence of the Belgian Congo) were nót Joseph Kabasélé and his African Jazz, but Fonseca with his Anges Noirs! Only at the last moment the Congolese delegation insisted on a Congolese alternative. This sheds a different light on this lp, don't you agree? 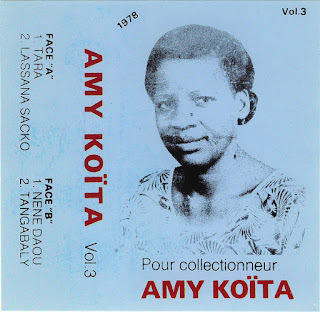 Recently the owner of the (highly recommended) Malian Divas channel on YouTube asked me why I have never posted any music by the third (see below) of those magic Malian divas of the 1980s: Ami Koita. I admit I did not have a good answer, apart from that I just haven't got round to her. But perhaps there is another, subconscious reason for my omission. I have met Ami Koita, when she visited the Netherlands in 1991. On the LolaRadio blog you can find recordings made during this trip by VPRO Radio (and a few days later she also performed in "Reiziger in de muziek" on VPRO TV). Both Ami Koita and her daughter, who backed her mother in the chorus, were very friendly. But it was impossible to talk to Ami more than a minute as her husband (on the left, holding a camera with which he videoed his wife's every move) was constantly making his presence known. And not only by standing in the background, but also by answering questions for his wife and physically putting himself between his wife and whoever wanted to talk to her. I later found out that this was the result of an extreme case of jealousy, and several rumours have gone 'round in Mali as to the (possible) grounds for this jealousy. One way or another, this has perhaps played a role in my apprecation of Ms. Koita. Getting back to her being the third: the other two of what was like the 'holy trinity' in Malian divaness in the 1980s were of course Kandia Kouyaté and Tata Bambo Kouyaté. And that reminds me that I should be digging up some more of those two in the near future. Anyway, I would like to share with you this cassette recorded in the late 1970s. The quality of the cassette is dubious, to say the least. And I have tried to remove the extreme hiss*. But I love the music. Ami Koita's rendition of the classic "Tara" is up there with the very best. And Nene Daou and Lassana Sacko have probably donated their life savings after being immortalised by Ami. And as a further illustration of Ami Koita's talent I would like to share with you this first part of a programme entitled "L'Artiste et Sa Musique" featuring Ami Koita "& son ensemble". And this ensemble consists of two great accompagnateurs: Moriba Koita and Bouba Sacko (see my earlier post). The show is presented by Zoumana Yoro Traoré, whom you may remember from the videos I posted by Kandia Kouyaté and Coumba Sidibé. I will post the remaining part of this programme at a later date. Ami is interpreting "Djeliya", a kind of metadata song, a song about griotism. Compared to Tata Bambo's song with the same title, which I have posted four years ago, you will have to agree that Ami's song is more delicate. Both her interpretation and appearance do justice to her reputation as the djeli with finesse. EDIT December 30, 2012: Ngoni has pointed out (see comments) that there may be a problem with the speed of this cassette. I have slowed down the recording to the speed he suggests, and it does sound better. So I have added a link to the slower version. * And in case there is any demand for the 'raw' sound of the untampered original, send me an email. On the brink of the festive season (or the end of the world) I think it is time for some seasonal music. And what could be more seasonal than four "rumbas corvées"? "Corvée" seems to indicate a certain level of exertion, of a type which may be getting more popular in these regions going by the rigorous measures proposed by our respective governments. I.e. unpaid! Do I see the shadows of slave labour and pre-industrial revolution labour conditions looming up through the mist of time? Luckily these gloomy visions are not reflected in the music. On the contrary, the music is better typified by the name of the orchestra: Festival des Maquisards, where "maquisards" is about rebellion and resistance against oppression by the common people. That's more like it! For the star of this orchestra is a young Sam Mangwana, here still presented under the name of Sam Moreno. Co-leader of the group is another ex-member of Rochereau's African Fiesta 66 and a contemporary of Mangwana (also born in 1945): lead guitarist Paul Vangu better known as Guvano. 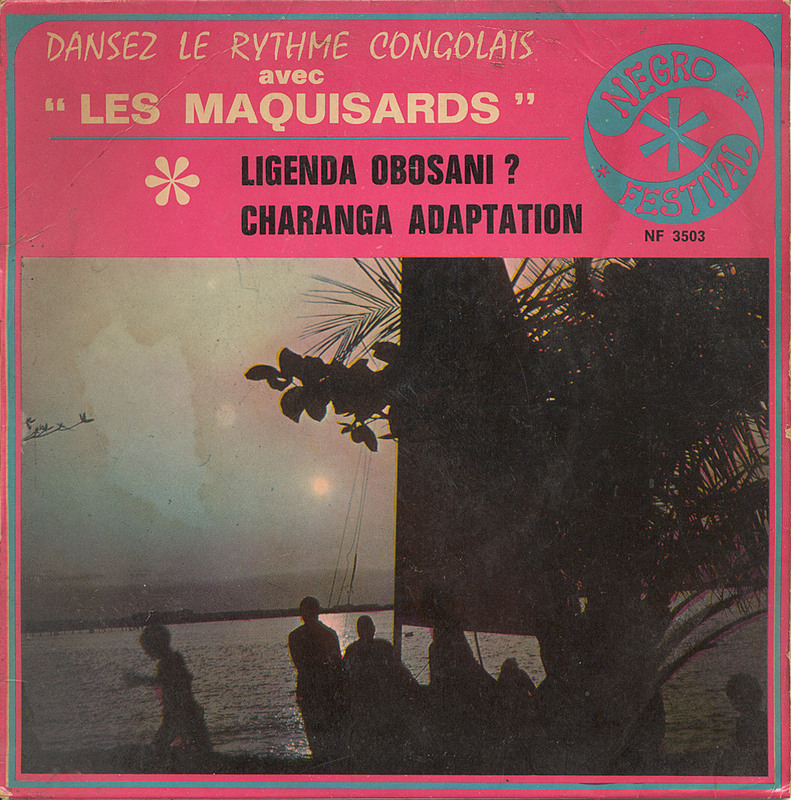 The first track features Mangwana in splendid form, with vocals clearly based on or inspired by his time alongside Rochereau. As in some of the songs with African Fiesta he demonstrates that he can compete with Rochereau on equal terms (within R's own singing style), while at the same time adding his own magical 'je ne sais quoi'. Sam has always had a 'real' quality in his singing, a quality which he shares with great singers like (for example) Josky Kiambukuta and Celia Cruz. No belcanto, no pretentiousness, very much 'de la rue'. I'm not sure who is accompanying him in "Ligenda Obosani? ", composed by himself. My first guess would be Lokombe (who at the time was called Camille Lokombe, but later became Lokombe Nkalulu), a very talented singer with a career lasting right on to this very day. In fact, if you are very quick you can see him performing with a former colleague from Les Maquisards, Dizzy Mandjeku, and his Odemba OK All Stars (also starring that superb singer Malage de Lugendo!) at the Tropentheater in Amsterdam this Saturday (December 15). But alternatively it is possible that Diana Nsimba, also ex-African Fiesta, is backing Sam. There is no doubt whatsoever about the second singer on the B-side. Ntesa Dalienst is very much present in this version of Celia Cruz's "Sopa en Botella". And for those who don't recognise his voice, he's the singer doing the 'chorus' starting at 1'15. This song seems tailormade for Mangwana and Ntesa. Mangwana does the best impression of Celia Cruz I have ever heard, and Ntesa adds a subtle touch of sophistication. A sheer delight! The second single, while significantly worse for wear when it comes to the physical state of the vinyl, delivers the same high musical standard. The A-side, "Catho Nakozonga", is composed and wonderfully sung by Lokombe, with Sam doing the backing vocals. The flipside is composed by a Gérard, and I am not sure who this is supposed to be. 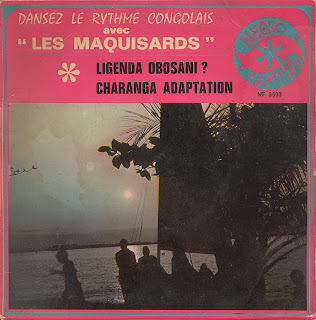 Ntesa once mentioned guitarist Gérard Biyéla, but as far as I know he was with Les Bantous, and I haven't heard his name in connection with Les Maquisards. 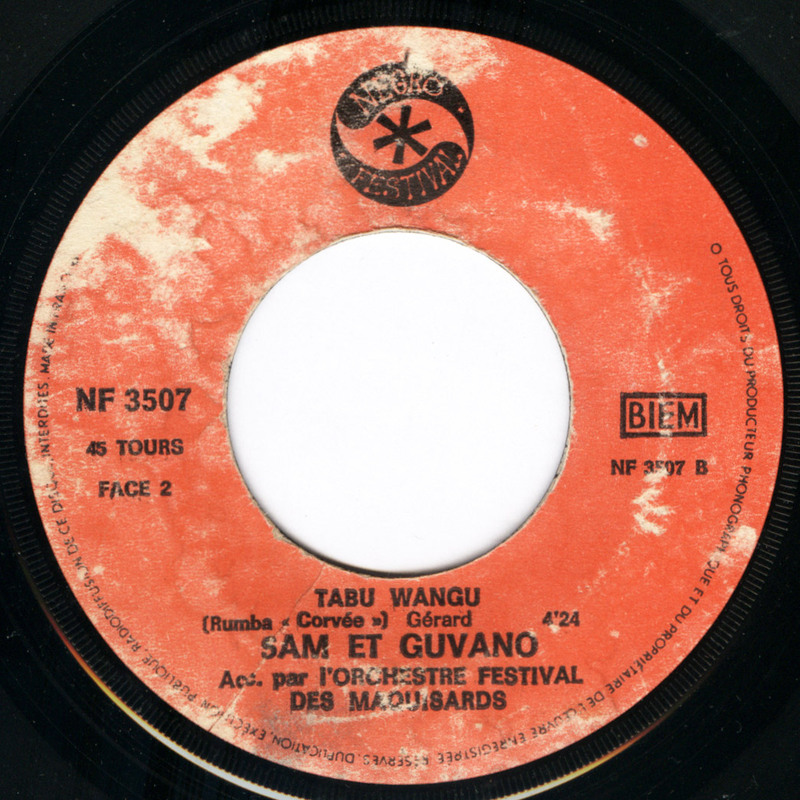 I am not sure if this is the start of Mangwana's career as a polyglot, but if I am not mistaken this "Tabu Wangu" contains some lines in swahili. It remains a mystery why these treasures have never been reissued.